Theoretically at least, the more sign seen, the higher the number of snow leopards that should be present within the surveyed area. However, the relationship between sign abundance and cat numbers is not necessarily linear or consistent from one site to another or even from one year to the next. More field studies are needed to establish and refine this relationship for properly “indexing” sign frequency under a given set of conditions. Many factors affect how often snow leopards leave their sign. For example, residents seem to mark more frequently than transients (individuals passing through the area), males more often than females and adults more than subadults. Besides varying seasonally, the amount of sign apparently depends upon the extent of home range overlap, presence of core use areas, the type of terrain, characteristics of the marking substrate, the population structure, movement patterns, encounter rates between individuals and so forth. 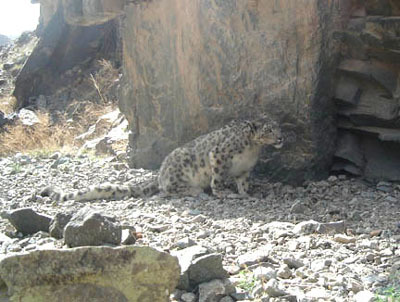 However, if sign surveys are conducted along the same transects over several years at the same time of year, it may be possible to determine whether the snow leopard population is stable, increasing or decreasing. But this requires running numerous transects, which may not be possible given the resources at hand or accessibility of the survey area (see paper by Ahlborn and Jackson 1988).